Ice anglers will do well this month to spend a couple hours preparing their ice fishing equipment for when the hard waters return to their favorite fishing spots. I suggest these must do items to ensure your ice fishing traps and equipment are in prime condition before the start of the ice fishing season. 1. Grease all moving parts with Frabill Sub-Zero or Blue Lube. 2. Replace any leader and backer lines that appear worn. 3. Make sure spools are tightly and evenly wound. 4. Adjust spools so they spin freely with little tension. 6. Startup ice auger, check for proper operation, replace spark plug if necessary. 7. Put a small first aid kit in pack basket. 8. Replace lead sinkers with a non-toxic substitute. 9. Sharpen ice chisels or hand crank augers. 10. Thoroughly check ice conditions before venturing out on any lake or pond. Ice is notoriously thin in Central Maine most years during December. 11. Review the new fishing regulations booklet. 12. Purchase new fishing license for 2019-20. 13. Have ATV or snowmobile serviced. 14. Check ATV or snowmobile registration. 15. Check operation of propane ice shack heater. Anglers this month would be well served to begin chasing brook trout on many of the stocked ponds in Central Maine. When the early winter ice is potentially thin, I prefer to stick close to the shoreline, as some of the best brook trout fishing occurs in only a couple feet of water. Since the typical shoreline contains a vast majority of the available cover and almost all of the food going deep is completely unnecessary. I’ve caught brook trout (and 38 inch Northern Pike!) in water so shallow I could hardly put a bait down. So, if the ice auger is hitting bottom, you’re probably in the right spot. While nobody wants to take an icy plunge through the ice in December, if it happens in two feet of water, it’s an inconvenience and not a tragedy. In alignment with the yearly IFW stocking reports, Jamies Pond received a healthy numbers of stocked brook trout in April and May. Jamies Pond in Manchester received 930 ten inch fish. In addition to brook trout, Jamie's Pond also supports good populations of smallmouth and largemouth bass. These species can provide good sport fisheries for anglers who choose to target them. Ice fishing requires anglers to fish vertically instead of horizontally. This means that covering water necessitates drilling a pile of holes all along a good stretch of shoreline. Anglers then systematically work down the shoreline employing the use of tip-ups and jigged lines, jumping from hole to hole. This system helps anglers locate brook trout holding fast to a spot of cover. Points and inlets are both prime ice fishing spots. Points provide structure and hiding places for small bait fish and inlets flush nutrients into the lake or pond attracting the small baitfish trout target. The ideal bait fish for trout is a 2 inch shiner, any bigger decreases catch rate. Shiners work great as long as they stay lively. Replace any bait not actively swimming around, lifeless bait does not attract trout. 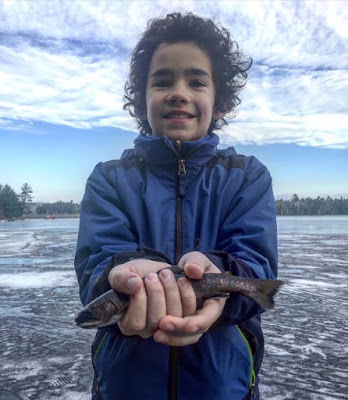 Patience puts brook trout on the ice. When a flag pops up but the spool is not turning, reset the flag without checking the bait. Finicky brook trout will often take the bait, trigger the flag, but then spit out the bait and swim around it. Jigging the ice hole can also help hook the bait stealer, something I have experiences many times. Winter brook trout anglers typically fish with either worms or minnows but there are times when the fish are just not interested in either. Jigging spoons can often trigger a bite response, on days when bait fishing slows. My favorite spoon is the blue/silver Little Cleo made by the Acme Fishing Company (https://www.acmetackle.com). Adding a small piece of bait to the jig hook will greatly increase scent thereby helping increase the catch rate. Also, when jigging for brook trout, don’t make big jerking movements, instead employ a smaller 6-10 inch jigging motion. Trout activity under the ice peeks early and drops off two or three hours after sunrise. This is because sunshine tends to push brook trout into deeper water. To extend the bite, place tipups along the eastern shoreline. This causes the rising sun to stay hidden behind the trees creating a shadow line that will last till late morning. Most fish species do not bite exceptionally well for 48 hours after a low pressure system. However, fish tend to feed aggressively 24 to 36 hours before a low pressure moves through. When the weatherman predicts temperatures in the 30’s, overcast skies and flurries, it’s going to be a good day to fish. On days when the brook trout are refusing to eat everything an angler can imagine to throw at them, a highly effective tipup rig can be made using a blue/silver Little Cleo or Dardevel. To rig the spoon, first remove the treble hook. Next attach 12 inches of 6-8 pound fluorocarbon leader to the O-ring and tie on a #1 baitholder hook. To the hook, thread on a large night crawler so that the entire hook is covered. Set the worm about a foot off bottom. While the spoon sparkles and reflects light, the worm triggers fish to bite.